Indian Prime Minister Narendra Modi warned Pakistan on Friday to expect a strong response to a suicide attack that killed 44 paramilitary policemen in Kashmir, ratcheting up tension between the nuclear-armed neighbours. “We will give a befitting reply, our neighbour will not be allowed to destabilize us,” Modi said in a speech, after meeting security advisers to discuss options. The first step, he said, would include removing most favoured nation (MFN) trade privileges that had been accorded to Pakistan – though annual bilateral trade between the countries is barely $2 billion. The Line of Control, the de facto border dividing Indian- and Pakistani-held Kashmir, is widely regarded as one of the world’s most dangerous flashpoints, especially after the two countries became nuclear armed states in 1998. On Friday, Islamabad said the two-day visit had been put back by a day until Sunday but the program would remain unchanged. It gave no explanation for the change. 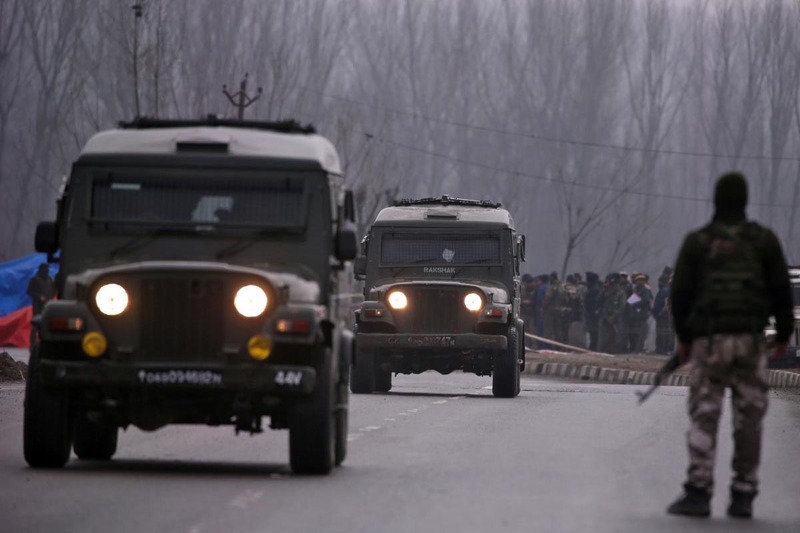 India’s Home Minister Rajnath Singh flew into Srinagar, the main city in Indian Kashmir, and joined mourners carrying the coffins of the dead policemen, before they were sent to their homes across India. The separatist insurgency has waxed and waned since the late 1980s, but began to pick up in the last five years as a fresh generation of Kashmiris was drawn to militancy. In the video, Dar warned of more attacks to avenge human rights violations in Kashmir. On Friday, hundreds of people gathered at his village of Lethipora to mourn his death. Jaish is one of the most deadly groups operating in Kashmir. Let there be no misconceptions about who protects Jaish-e-Mohamed. The global power shielding JeM is China. Three times in the past China has blocked India’s move to have Jaish founder Maulana Masood Azhar blacklisted by the UN. For the 4th time China has done it again. India’s response should be comprehensive not just tactical. Just imagine, Pakistan was enjoying the MFN status until India withdrew after this attack. It’s like when China enjoyed all those unfair advantages in its trade deal with USA and no leader from US could do anything about it until Trump came. Trump reiterated to Pakistan after this terror attack. Indian leaders of all political persuasion have been bending over backwards to please the Chinese communists. The Chinese on their side have been sweet talking while they have repeatedly protested the visit of PM Modi to Arunachal Pradesh. With the tragic loss of 40 CRP lives in Kashmir by terror group Jaish-e-Mohammad based in Pakistan, India has revoked the Most Favoured Nation Status to Pakistan and warned of other serious consequences. What India must also take into account is communist China’s consistent effort to block the leader of this terrorist out fit Masood Azhar as a terrorist by the UN. It is communist China who has two sets of standard when it come to terrorism. In East Turkistan, the Muslim Turkic people are kept in concentration camps which the Turkish Foreign Minister rightly described as a “great shame for humanity”. They have used every opportunity to call the freedom fighters of the Uyghurs as “terrorists” and kill many innocent Uyghurs by justifying them as “terrorists”. On the other hand, China is a supporter of the leader of the Jaish-e-Mohammad terror out fit, Masood Azhar! How does this tally with the oft repeated Chinese claim that it is “against terrorism in all shape or form”? Does it not follow that by supporting a terror group who have claimed this Thursday’s dastardly attack on India amount to collusion with the terrorists? Is this a friendly act? India must not just hold Pakistan responsible but also the supporters of terrorists like communist China. China made no mention of Pakistan in their condolence message to India and this shows the double faced nature of the Chinese. Because of Chinese persistent protest about Modi’s visit to Arunachal and their rejection of Azhar as a terrorist, India should NOT allow Xi to visit India.